Download this free coloring sheet to help children learn the Bible’s definition of love from 1 Corinthians 13. You could use it around Valentine’s Day or anytime you are teaching about love. Click on the preview image above, or use the links below to download. You can leave a comment below to thank Mandy for her work, or share how you will use this free coloring page in your ministry. 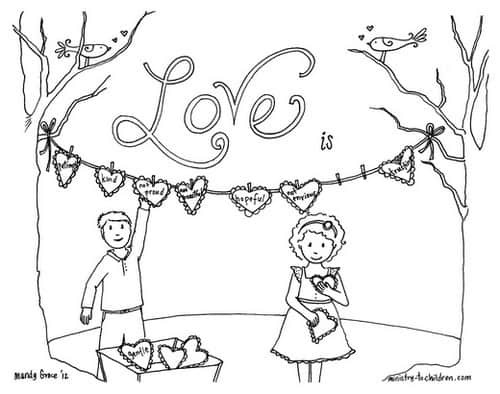 You may also enjoy our love God coloring sheet based on the greatest commandment in Deuteronomy 6. Ask the children if they can remember where those qualities (or definition) of love can be found? Ask the children who they know who is a good example of each quality. For example, tell me someone who is a good model of patience? Ask the children why the trees have not leaves in this picture? Hi Mandy: Thank you so much for all the time and effort and love you spend developing the S.S. lessons for ‘us’ to share with our little ones. It is so helpful and the children not only enjoy the stories but the colouring pages as well. Word Finds, Colouring pages, add to the opportunity that ‘the lesson’ will be understood……thank you Mandy. May God continue to bless you with opportunities to share your talents and gifts with the little ones that He loves so very very much. Thank you so much! I love using these with my kids for our Bible Memory verse time in our homeschool. Thank you for the encouragement – so glad to hear that we are helping your homeschool in this way! Tony Kummer (Editor) reviewed & updated this page on : February 17, 2015 at 1:18 pm. All our content is peer reviewed by our readers, simply leave a comment on any post suggest an update.